It’s with some pride that I note my Cassini Iapetus animation got a small mention from NASA GSFC’s Astronomy Picture of the Day for September 15th, 2007. It’s not the main feature photo (that’s a red/blue 3D stereogram of the ridge) but I do get a link below it, on which, if my referrer log is any indication, a lot of people are clicking. 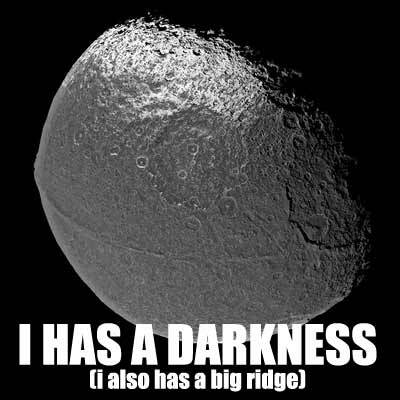 So there’s another 15 minutes of fame for me, thanks to Cassini and Iapetus. Here is an LOLIAPETUS just because I am feeling silly.